Liz Nugent is a hell of a writer. Fellow reviewers and crime writers whose opinions I really value have been telling me that for a couple of years now, so soon after SKIN DEEP won both the Crime Book of the Year and RTE Radio 1 Listener's Choice prizes at last year's Irish Book Awards, I grabbed it from the TBR mountain and quickly dived in. I'm very glad I did. Liz Nugent is a hell of writer. 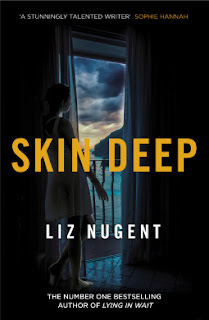 SKIN DEEP is a chilling tale that's not the easiest of reads. Nugent writes beautifully but her main character, Cordelia Russell, goes far beyond unreliable or even unlikable. Candidly, she's rather appalling. Yet still, thanks to Nugent's sublime kills, very compelling. This is an absorbing read that draws you in even if you feel very little empathy for the main character. Nugent brings both the Mediterranean setting and Cordelia's childhood in Ireland to vivid life, as we follow her twisting and twisted journey from young girl living on a remote island to ageing socialite. Cordelia is the kind of person who leaves chaos and ruin in her wake. But when part of her past comes calling, what will happen? Will she be able to smile and swindle her way through again? SKIN DEEP is much more of a psychological thriller than a crime novel, though there's dashes of criminal activity throughout. It's a strangely addictive read that pricks at the mind and the emotions. Cordelia is vain, self-absorbed, narcissistic, even cruel, but her journey is a truly fascinating one that I felt compelled to follow from beginning to the book's end. Nugent makes some courageous storytelling choices and this book is likely to stay with you long after you finish. Liz Nugent is a hell of a writer.